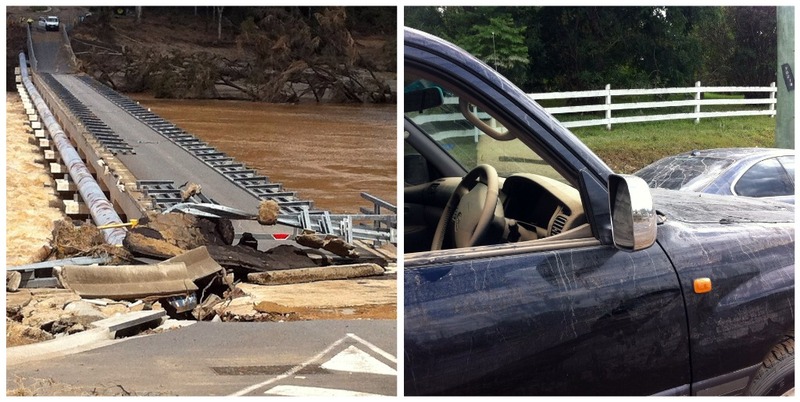 Brisbane, Toowoomba and the Lockyer Valley were hit by floods in January. Unfortunately many lives were lost in the massive, unexpected floods in Toowoomba and the Lockyer. Whole towns were swept away. Lufflump and I were away when the floods began in January and came home the day before the floods peaked. It was stressful, heartbreaking and scary. 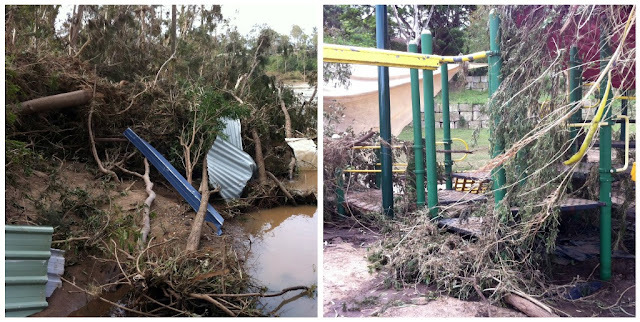 The Brisbane River was fierce. The city was like a war zone. Our home was safe but our suburb was hit pretty badly. The day after the floods peaked we went for a walk to see the levels. 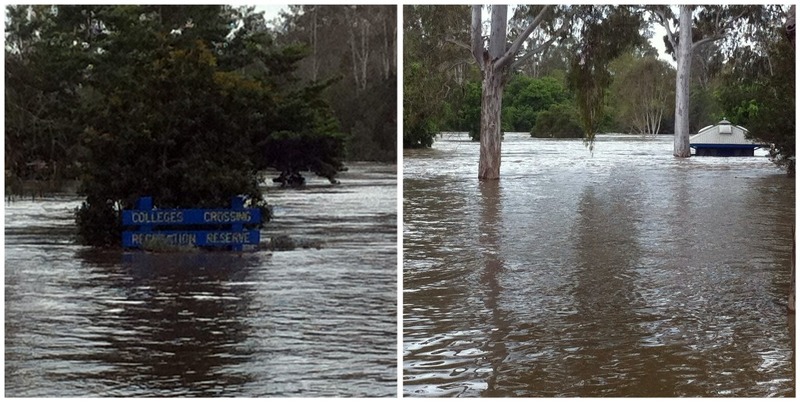 Our local park, bowls club, golf club, and university were under. Units we were going to rent before finding our home went under. We never expected Brisbane to flood although where we previously lived we experienced a flood in October when the dam gates were opened the first time. The day after the floods peaked the mister went and helped family friends who almost lost everything. He also had to rescue our car and go see how his grandparent's house in Bellbowrie had fared (thankfully their street was one of few that weren't hit). I went for a walk that afternoon around Toowong to see if anyone needed help. The mud was thick and stank. 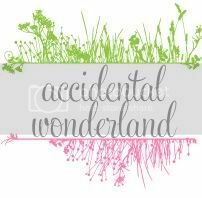 I spoke to a girl whose grandfather lost everything and a guy whose sister was overseas on holiday and her ground floor unit was inundated. The next day I went and volunteered in Milton. I didn't expect what I found. It was devastating. I made some banana muffins that morning and gave them to volunteers in some houses. The owner of the house burst into tears thanking me. Fourex beer donated uteloads of beer to volunteers and police officers who all cheered each other in the middle of the street. It was wonderful seeing the city folk come together. One of the hardest inner city suburbs hit was Rosalie. A couple of friends and I went to volunteer but everyone was pretty much cleaned out, just waiting for insurance companies to begin the process. A piano was out on the corner next to amazing artwork. I pressed the keys expecting noise, instead the keys were glued together. There was no saving it. Heartbreaking. As soon as we could, the mister and I volunteered further out the city, at Fairfield. I didn't know what to expect but what we were faced with was horrific. Whole houses had been under water up to their roof. People lost everything including birthday cards, photos, letters, antiques - you name it, we put it into skips. We worked with the army and the Salvo's provided a free BBQ. It was a real team effort. We were so fortunate that we had a warm house to come home to. So many didn't and still don't. There are so many houses and businesses throughout Goodna, Southbank, Rocklea, Fairfield, and out around Ipswich. Devastation still continues for some people. 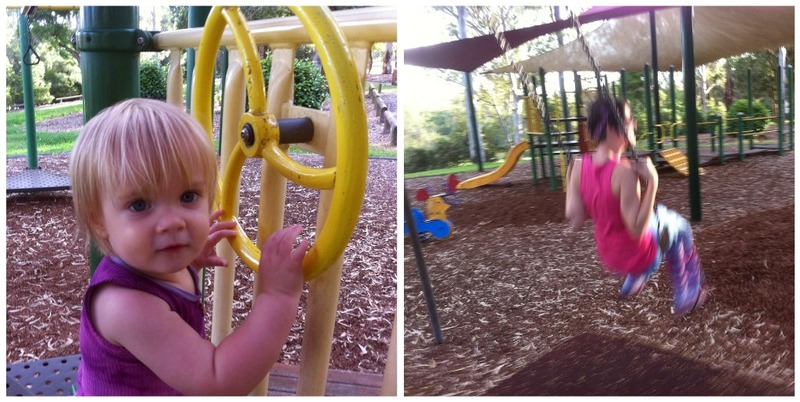 In fact, we went out to Karana Downs today to fish at College's Crossing where there was a lovely park and cafe. They are no longer there, it's simply grassland and still looks like a bomb hit it. The beautiful park lufflump and I used to often go to was washed away. I still know that Karana Downs and surrounding areas still are lucky. Bellbowrie Coles is open again and they've used the floods to their advantage, upgrading the building and stores. Most people have been able to go back to their lives, sleeping in their homes and attending work. But so many haven't, their homes are unliveable, their workplace no longer operating. These people should not be forgotten. The water may have subsided but their pain continues. The theme for Mental Health Week 2011 is 'You Lent a Hand, Now Lend an Ear' with the aim that people reach out to those they know were affected by the floods and make sure they are ok. There house could be cleaned up but mental health problems could be just surfacing. So what can you do to help those who were affected by the flood? Have a coffee with them and see how they are, ask if they are ok. It can honestly be as easy as that. Check on them, ask them if they are mentally ok, ask them if you can do anything. Maybe make a meal they can freeze or buy something to replace an object they lost in the floods or open your house to them. Think about what you would like if you were in their situation and do it for them. Will you extend an ear if you know anyone affected? How? This post bought tears to my eyes. 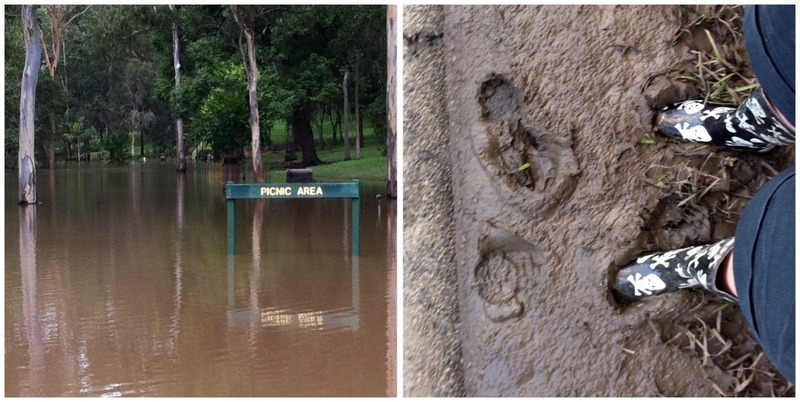 The flooding in Brisbane was such an emotional time for us all. What a beautiful connection - so often people are willing to get in and lend a hand, do the physical stuff.... but for some reason listening, letting people really open up, is more difficult. Thanks for this timely reminder. I just read an article in today's Courier Mail that properties that were damaged by the floods in Corinda have been served with notices from the Council ordering them to clean up within 14 days or face $2000 fines. Can you believe it!? I wish those councillors would read this post! Amazing post. Brought back a lot of memories of that time for me. 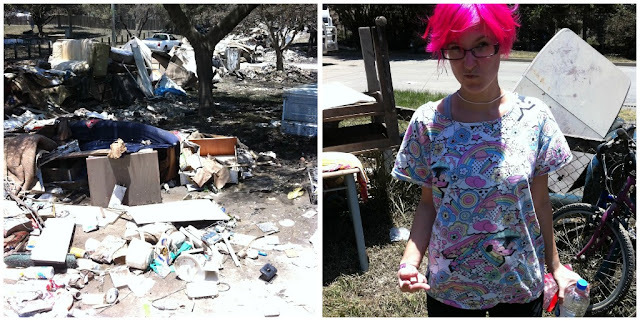 Though I didn't volunteer to help with the physical cleanup, I felt my contribution was helping customers over the phone who had been affected (I worked in a Disaster Relief team for a phone company at the time). It was emotionally draining and the stories I heard broke my heart on a daily basis. I don't know anyone who lost their home - but I hope this initiative encourages people to reach out to those who still need an ear, or a shoulder. Wonderful post Ames! Good on you for volunteering! It is a great reminder that although the water has receded there is still (and will be for awhile) a lot of work to be done and a lot of lives that were ruined. I thank you and the Mr for what you were able to do in a practical way. Those of us in other cities and states, not knowing the locale or anything other than the TV pictures were "with you" with hearts in our mouths. Truly devastating, and before our eyes - and via twitter. I know I helped in a small way via donations, also taking part in an auction by authors, and bundling up baby clothes for a mum to be who'd lost all of her stuff...but Purple Cath is right...and so are you for reminding us. This is great. For many people, the floods were insignificant. We had friends that lived a few suburbs away from us that weren't affected at all - and had no idea of the devastation. (Our street wasn't flooded, but many homes near us went under). It's easy for us to get on with our lives, yet those whose lives have been turned upside down are still working through many issues. A great reminder for everyone to take a moment and consider others.